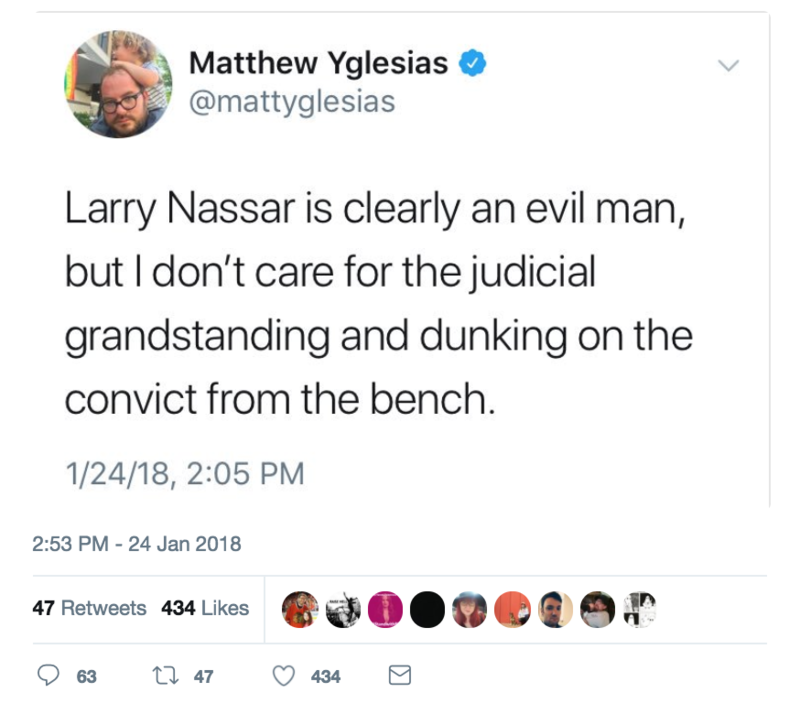 Vox co-founder Matthew Yglesias wrote and then quickly deleted a controversial tweet regarding Olympic gymnastics doctor Larry Nassar, who was sentenced to up to 175 years of prison Wednesday for seven counts of criminal sexual conduct. Nassar molested a multitude of women and girls during his time working with the American Olympic gymnastics team. Yglesias deleted the tweet approximately an hour later, after he was “convinced” by other Twitter users. Judge Rosemarie Aquilina presided over the case and ultimately sentenced Nassar to over a century of prison time. During the sentencing, she spoke about Nassar with contempt. “You’ve done nothing to deserve to walk outside a prison again,” Judge Aquilina said to Nassar in court.